Since it was the first half, the Spurs had to inbound the ball from the opposite free throw line, about three-quarters the length of the court from their own basket. 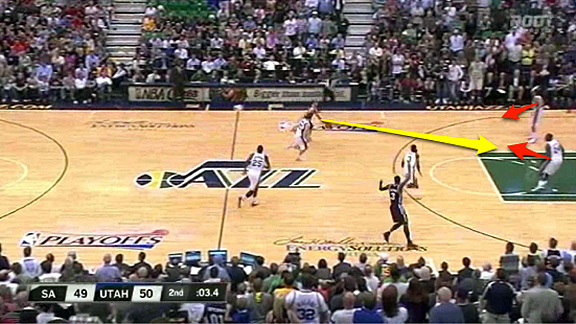 Manu Ginobili set up under the Jazz’s basket, right along the baseline. 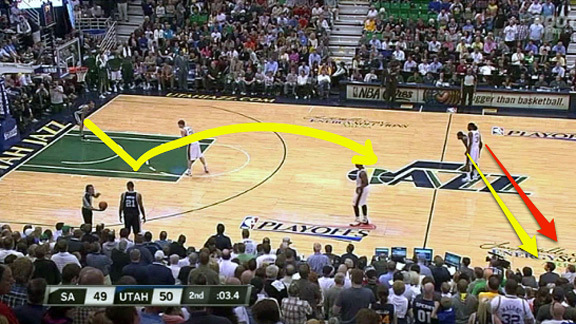 Stephen Jackson stood at half court, parallel with Ginobli. As Tim Duncan inbounds the ball, Jackson turns and sprints to the near sideline (toward Duncan), and his defender follows. 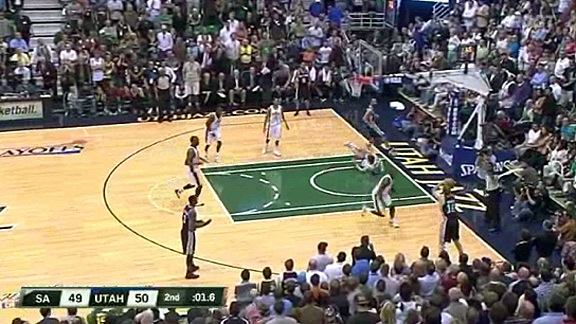 Jackson is simply the decoy on this play, clearing out space for the real option — Ginobili. He sprints up the court and gets ahead of his defender. When Jackson clears out and brings his defender with him, Duncan has a window to lob the basketball. He hits Ginobili perfectly, allowing him to make the catch and attack the basket in one single motion. As it looks like Ginobili will try to score, the defense collapses in on him. Popovich anticipated this reaction, and thus he placed shooters Tony Parker and Matt Bonner in the corners, with Bonner on the weak side. If his defender helps on the Ginobili drive, he has a longer distance to cover when helping and recovering. That’s exactly what happens here. 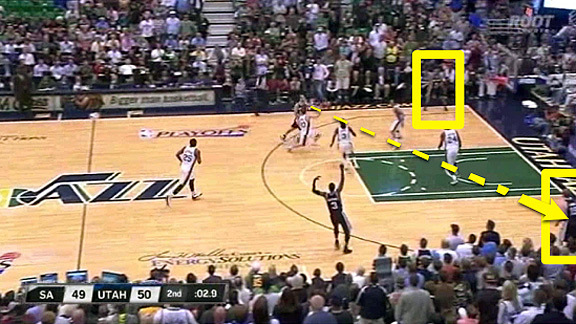 This was a great play call from Popovich, but it was ultimately successful because of the players’ execution. Without perfect passes from Duncan and Ginobili, or the timing between Ginobili and Jackson, the Spurs wouldn’t have been able to grab all the momentum at the end of the half.